Nicalis founder Tyrone Rodriguez has been tweeting teasing pics of The Binding of Isaac: Rebirth running on iPad and iPhone over the past couple of weeks. Then last night he shared Apple’s rejection notice. Based on the story from the Hebrew Bible in which God asks Abraham to sacrifice his child, Isaac, to test his faith, The Binding of Isaac is a 2D procedurally generated dungeon crawler featuring a young boy attempting to escape his mother, who’s been given a similar mandate. 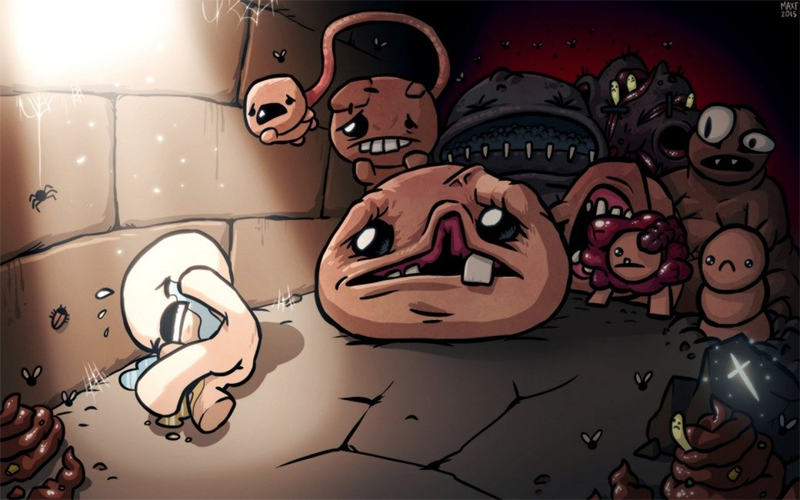 Designed by Edmund McMillen and Florian Himsl, the game originally released on PC before being upgraded with a new engine and content as The Binding of Isaac: Rebirth. The new version of the game has been ported to various game consoles, including PlayStation 4, Xbox One and PlayStation Vita. It’s even made an appearance on the 3DS and Wii U, two systems from Nintendo, a company known for strictly policing objectionable content. In fact Nintendo rejected an earlier port of the game for the 3DS, only its rejection was based on religious overtones rather than child abuse and violence. As for Apple’s claims that the game features violence towards or abuse of children, I can see where they’d get that impression. The game is about a boy trying to escape his mother, who’s on a mission from god to end his life. The main image that springs to mind when thinking about the game is it titular character huddled on the ground crying, surrounded by monsters. Hopefully Rodriguez and friends can find a way to make Apple see the light. I’d love to see the game on iPad or play it via the Apple TV that’s collecting dust on my TV stand. We shall see. In the meantime, check out Patrick Klepek’s excellent interview with Edmund McMillen about the game’s biggest secret and how it nearly broke its creator.